Nath offers a discount of 50% on their first / introductory lesson! In 2014, Nath won Best Musician Award at the National Eisteddfod. He is a very passionate Welsh speaking music graduate who really enjoys inspiring individuals. 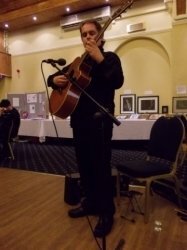 He appears frequently on Welsh TV and Radio performing and raising awareness on Asperger Syndrome, and let it be stressed his very strong belief that everybody is equal and no one is perfect - which means that Nath enjoys working with people of numerous levels and is always open to consider their needs. Nath has experience teaching multiple groups of individuals and working one to one. This includes people - from all levels from beginner to expert - who come from many different backgrounds, some of which have additional needs. Recently Nath completed tutoring a 12 week music course which culminated in a performance by every one of them. Nath's approach is characterized by patience, enthusiasm and encouragement. He stresses also that additional needs are of vital consideration and he will always strive to meet these requirements.